How could an elitist institution acquire a virtually unique standing around the world? Because it reconciles the conflicting experiences of immersion and engagement in a place of sustained silence while the world has become too lonely for the individual and too loud for our ears. 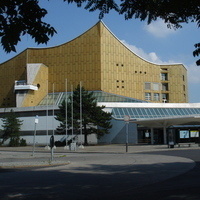 After yesterday’s Museums, today’s Concert Halls extend the quest for a collective experience of intelligence at play. The challenge of designing Concert Halls as urban landmarks has solicited some of the most imaginative architectural ideas. Kurt Forster is a Visiting Professor at MIT in Spring 2018. He will teach a graduate seminar titled "How the History of the Earth Infringes on Architecture." Mr. Forster has taught at Stanford University, Massachusetts Institute of Technology, ETH Zurich, and Bauhaus University at Weimar and founded and directed research institutes at the Getty Research Center in Los Angeles and the Canadian Centre for Architecture in Montreal. He has organized major exhibitions on Schinkel in Chicago, Carlo Scarpa in Vicenza, Italy, Herzog & de Meuron in Montreal, and for the 2004 Venice Biennale. Mr. Forster has published widely on the history of art and architecture. He is a member of the Research Council of the Palladio Center in Vicenza, Italy; the Bauhaus Foundation, Dessau, Germany; and the Accademia di San Lucca in Rome. Mr. Forster attended the universities of Berlin, Munich, and Florence and received a Ph.D. from the University of Zurich.